Free Phone- ONE-TIME activation fee $9.99! 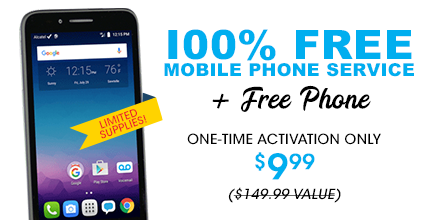 **DEAL ALERT** 100% Free Mobile Phone Service + FREE Alcatel OneTouch Conquest LTE Smartphone with only a ONE-Time Activation fee of $9.99! While supplies last so don't miss out! ! I am trying to place an order for the franklin 850 which is being sold for $9.99 (for activation fee). I have tried to pay with several credit cards with two paypal accounts. Still, no luck with this. Can someone help me please? I placed it yesterday the first one around noon and the other around 11pm. The 11pm transaction only debited from my account but said there was an "unexpected error" and i didnt even choose a number or anything. I ordered one and got a kyocera hydro vibe instead... be thankful you didn't get completely lied to like me. Did you received any order numbers at all you can provide us with? We certainly understand you frustration considering that you ordered one device and got another. This took place because Alcatel devices were out of stock for so long that to accommodate customers and prevent them to keep waiting, sent a Kyocera Hydro instead. If it is an authorization only, it will be removed soon. Is that this offer is still valid, because I want to make an order but I can not? The offer and checkout page attempts to charge 19.99 for the activation, however the deal is advertised as $9.99 activation. How do I get the system to charge the $9.99 rate? I tried to order the phone that was free with $9.99 activation. When I get to the place to pay the $9.99 it shows the payment of $21.24. HTF??? I am trying to place an order for the franklin 850 but didn't know how. don't know why but i have tried the payment link multiple times, but it don't worked for me. i am from india. If I have the free SIM I bought and activated before, can I buy this deal and use that SIM for this phone? No it won't. The phone offer is cdma. It has a Sprint sim and you would have the gsm (AT&T) based sim if purchased from Fpop. Would it be a good idea or bad idea to buy these and give them out to the homeless? Everyone's insight is welcome and desired. It's important to bear in mind that in order to use these services an email address as well as personal information is needed when signing up. And although we do provide pre-paid SIM cards, most of our devices require a valid credit card in order to keep the account Active at all times. However, if you are interested in purchasing devices, you can go to any of our retailers like Wallmart, Best Buy or any of our Online retailers, mainly Slickdeals.com. it is a very good offer I really appreciated, thank you.